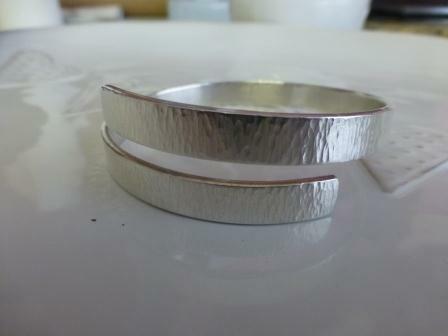 This heavy wrap-around style bangle is handmade from 8mm x 2mm silver and textured with a bark pattern. It is then polished to a high shine. Bangles are usualy supplied in meduim size (6.5cm internal diameter) but other sizes can be made to order. The wrap-over portion is approximately 4cms. Beautifully crafted and presented bangle.